Of all the city markets I’ve visited around the world, few are as large, chaotic, or diverse as Pike Place Market in Seattle, Washington. Open since 1907, Pike Place Market cascades down a hill overlooking the waters of Elliot Bay below. Because of the market’s hillside location, it consists of multiple, labyrinth-like levels, each with something unique to offer visitors. From produce to souvenirs, and everything in between, there is quite literally something for everyone to enjoy at the market. So, when Hipmunk asked me to write about Seattle for their #HipmunkCityLove campaign, I knew I had to write a bit about some of my favorite places to visit in the market. Since the market is so big and sprawling, it can be hard to make sure you don’t miss the highlights. 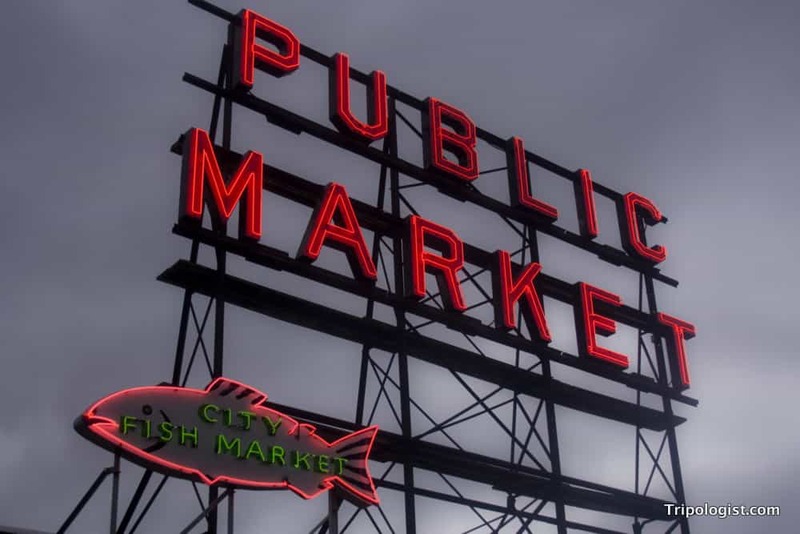 So, I’ve taken the time to compile together a list of the top five places that you should be sure not to miss when visiting Seattle’s Pike Place Market. 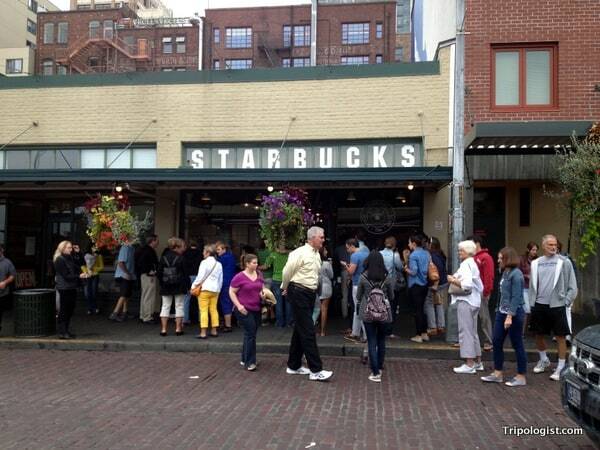 A visit to the very first Starbucks is a must when in Seattle. Unless you’ve been living in the mountains of Mongolia, you’ve likely had a cup of Starbucks Coffee at some point in your life. And, love them or hate them, Starbucks is one of Seattle’s most iconic companies. Back in 1971, the first Starbucks Coffee store opened one block from Pike Place Market, and, in 1977, the original shop moved into the heart of the market area, where it is currently located. While this Starbucks doesn’t serve anything that you can’t get at any other location, it’s worth a stop for the sheer novelty of visiting the first of the company’s 20,000+ locations. Lines at the shop can get very, very long, so try and visit early in the morning or late in the evening to ensure you don’t have to wait forever for your coffee. On the top floor of the market is an area dominated by some of the most beautiful flowers that you’ll ever see. No matter what variety of flower or what color you’re looking for, the flower sellers at Pike Place Market are sure to have something to wow you. Even better, the flowers are sold at insanely cheap prices, making them an affordable option even to those visiting Seattle on vacation. However, even if you aren’t interested in buying any flowers, a walk through this part of the market gives you a glimpse at one of the most beautiful places in all of the city. The flying fish are a popular attraction at Pike Place Fish. 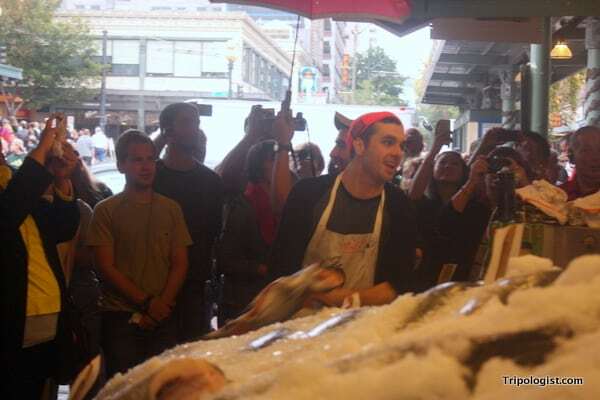 If there is one image that people tend to associate with Pike Place Market, it’s flying fish. And, Pike Place Fish, located on the market’s top floor is the place to go if you want to see a red snapper hurtling through the air. Seeing the flying fish is something that shouldn’t be missed while visiting the market. Unfortunately, though, the fish only start flying when someone places in order. However, the shop’s clerks do a good job entertaining the crowd during the downtime. It’s also interesting to spend time looking at the many different varieties of fish that are on display at the stand. It really is quite impressive to see. Located in a newer annex next to Pike Place Market is The Pike Pub and Brewery, which is home to The Pike Brewing Company. Open since 1989, The Pike Brewing Company brews over a dozen different beers, ranging from ales to stouts, many with the hoppiness typically found in west-coast beers. After a busy day of sightseeing in Seattle, sitting down for a couple local brews can be a great way to end the day. Even better, the brew pub’s food receives rave reviews on sites like Yelp and Trip Advisor. The gross, but still somehow cool, Gum Wall in Pike Place Market. Just like the flower stands are beautiful because of the myriad of colors present, so too is the gum wall. 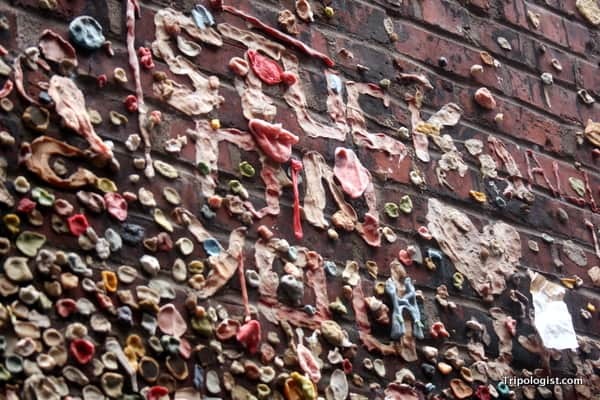 What started simply as a place people would put their gum before entering the theater next door, has turned into one of Seattle’s most fascinating, beautiful, and disgusting attractions. Today, thousands of pieces of used chewing gum dot the wall along Post Alley outside of Market Theater. Some of the pieces are simply stuck to the wall, while others are part of messages or artwork entirely made out of gum. Voted as one of “the top 5 germiest tourist attractions” in the world, the wall is one of the oddest places to visit that you’ll find anywhere in the United States. Overall, you can’t go wrong during any visit to Seattle’s Pike Place Market. Whether you wander the stalls looking for produce, artwork, souvenirs, or just entertainment, you’re sure to find something you’ll enjoy in the market. Have you ever been to Pike Place Market in Seattle, Washington? What are your favorite things to see and do there? Let me know in the comments section below. Love Pikes Place Market. Lauren and I spent hours there walking around sampling goodies and absorbing the local flavor. There was a huge line at Starbucks when we visited, so we stopped in at their secondary location about a block away. Since my wife works at Starbucks, we had to go to the first one, but first thing in the morning, the line wasn’t any worse than any other Starbucks in the city.